Whether you want birds for backyard pets, breeding, or show, we look forward to working with you to meet your needs. We have been raising birds for over 16 years. Though the varieties we raise have changed in time, our attention and eye for the exceptional bird has not. We enjoy hatching and raising the birds and this is where our attention remains. Since we do not currently show, we actually offer our best birds for sale. We are business minded farmers and driven to provide our customers birds that suit their needs. We enjoy working with you, our customer, almost as much as we like to farm and raise poultry. We strive to raise the perfect bird. The ideal Call Duck has a deep wide body, thick neck, round and wide head, and a short wide bill. Similar to what most Call Duck breeders face, some varieties are more advanced than others. Therefore, we have made some crosses that might seem strange as they will take generations to recover color, but with limited gene pools in some varieties, we needed to get back to the basic structure of the Call. If you have interest in improving your lines of Calls, we may have a specific bird to meet that need. We are diligent about keeping records of our birds to record their lineage. The Black East Indie is a striking small duck with emerald green iridescence. Their body shape is streamlined from bill to tail. We focus on keeping bills and legs black throughout. We also have a the blue variety in a smaller number. This blue-slate color is attractive and a nice addition to any flock. 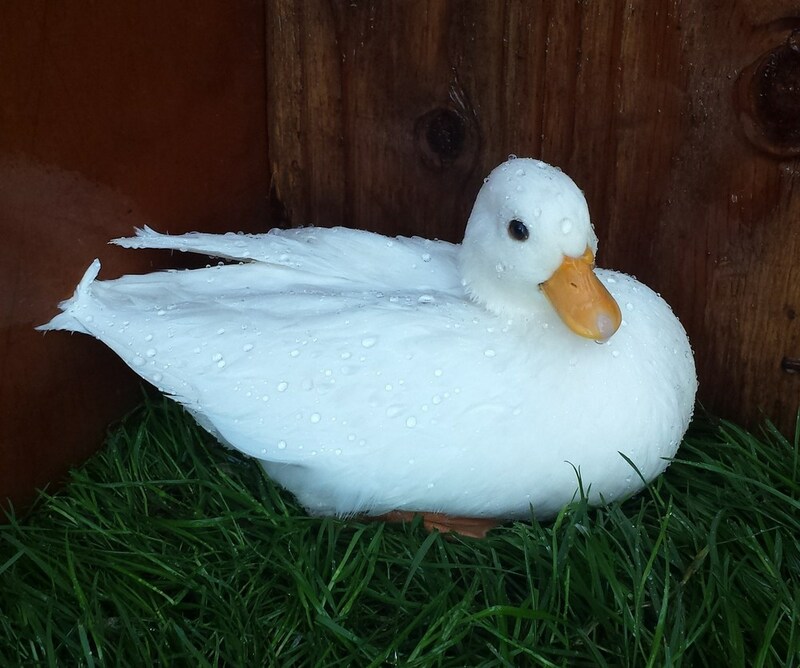 The Australian Spotted is a beautiful duck, the largest in size of the bantam ducks we raise. They are inquisitive and calm, much like the Call, while being easier to hatch. We raise greenhead, bluehead and silverhead varieties. We are selling young adults starting fall 2016. Miniature Appleyards are a burst of color. You'll appreciate their personality and the vibrant colors across the color spectrum. They are slightly smaller than the Australian Spotted but larger than the Call. Beau has been working with S.C. white and black Minorcas since he was a teenager. Minorcas are an impressive sight and demand your attention. They are big in every way. Our Minorcas have excellent heads and great feather quality (especially in the black variety). Our blacks tie back to both Richard Schock (NC) and John Tenneson (WA), and have added blood from a couple other sources. Thanks to both of these breeders for getting us a great start. The whites started from one R.C. white pullet hatched from 48 (mostly scrambled) eggs from Fay Forward. By crossing this female to a Schock S.C. Black male we were on our way to whites who rivaled blacks in almost every way. After years of breeding and selecting, we have been able to distribute high quality whites throughout the country. Many of the white Minorcas in the US have ties back to our line. We want to continue distributing this true heritage variety throughout the country to prevent possible extinction. Bantam Wheaton and Blue Wheaton Ameraucanas are vibrantly colored, hardy, and friendly. They lay a pretty blue egg and do well in cold climates. They were very popular 20 years ago in Montana, due in large part to the promotion Koralyn Kibbee did here of all Ameraucanas. Today, they are harder to find and we are eager to improve type and color. We are thankful that we were given a great new start with this breed in 2015.